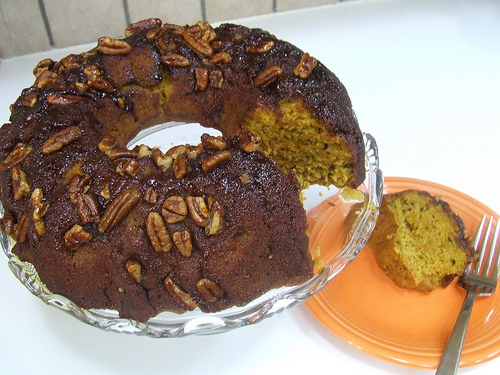 This cake is so moist and delicious and the pecans give it that perfect crunch. The rum pairs so well with the pumpkin...perfect for an afternoon (or morning) treat! Preheat oven to 325 degrees and grease a 12 cup bundt pan. In a large mixing bowl beat the butter, eggs and sugars until creamy. Add in the canned pumpkin, applesauce and rum. In a medium size bowl add in the flour, pumpkin pie spice, baking soda and salt and whisk until combined. Slowly add the dry ingredients into the wet and mix until smooth. Place the pecans on the bottom of the greased bundt pan and pour the batter on top. Bake for 60 - 70 minutes or until cooked through in the center. Allow to cool for 10 minutes. While cooling, place butter, sugar and water into a medium sauce pan and bring to a boil. Remove from heat and stir in the rum extract. With a skewer or wooden stick poke holes all over the cake and pour the glaze over the cake. Allow to cool completely and remove from pan.